Urbanistic chaos and eclectic buildings of the quarter between Grzybowska and Twarda Streets and Jan Paweł II Alley conceal an unrealized potential – splendidly placed and heavily tree-covered space remains sheltered and inaccessible at the moment. 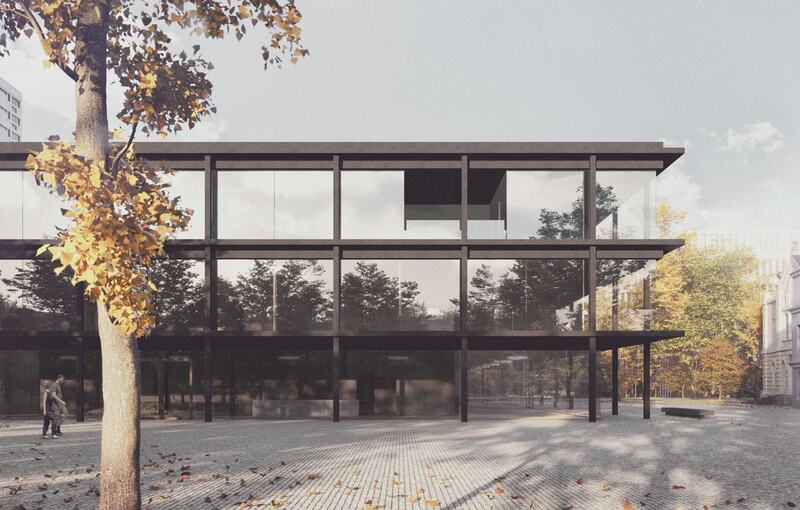 However, the building of ‘Twórcza Twarda’ Cultural Centre along with the current surroundings and greenery are about to create a cozy, yet welcoming public space. The object is bound to be of significant importance for the local community, as it will define the future vibe of public space and the direction of further development in the context of the entire quarter. The building of the Cultural Centre is placed in the very heart of the quarter. Along with the adjacent structures, it defines the public space that communicates all the nearby cycling roads and footpaths. The location of the object in the north-west corner of the quarter results from our respect towards the historic surroundings and the evident spatial relations between each and every part of the neighborhood. The scale of the object, adapted to its surroundings, humanizes the space dominated by the multitude of high-rise buildings. The Cultural Centre, disappearing among the trees, becomes a part of the green, secluded enclave in the city center. The object implements the idea of open, public architecture that tends to shape the social relations – its extrovertic character remains visible in its every aspect. Functionally, the object refers to the urban planning schemes. The ground floor opens up from every side of the building, allowing for the multidirectional connection with its user and surrounding space. Glazed, peripheral foyer – an internal multi-purpose square – is a natural extension of the public space, while a notch in the ground floor becomes a lure that attracts every passer-by, inviting to step in. The upper floors in the project are also entirely glazed. Such solution provides maximum lighting and enables visual contact with the outside greenery. The materials that have been used for this particular project send a clear and honest message. The reinforced concrete structure of the building can be seen in its entirety, revealing the beauty of a natural raw material.